ok new version is online with plenty of fixes and revert back to old multitouch code with somes attempt to fix the sticky button. if the new multitouch code will still have sticky button, i'll study in detail this part. Ever get the chance to try out HLE? Also, is it just me, or does it seem to run significantly faster with the real BIOS now (despite the graphics). Hi, I've got problem. I just can't install FPse from market, It won't download. -Darkyy JS3 (9.2) - needed market fix, after that.. won't download. -wipe, JS5 (not from Darkyy) - same situation. Anyone have got this problem? 19arek93 wrote: Hi, I've got problem. 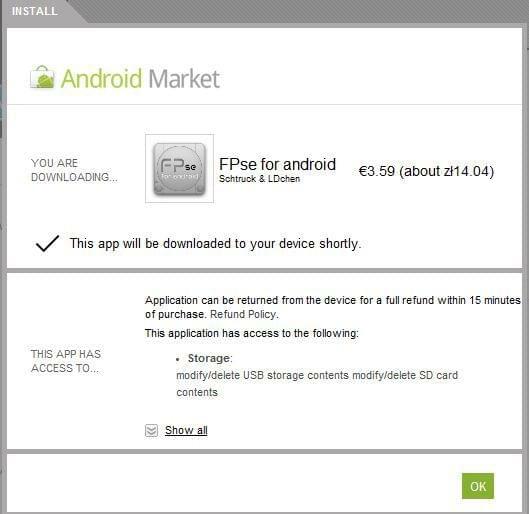 I just can't install FPse from market, It won't download. Did you check to see if your payment went through? I had similar troubles when I was trying to pay with a bank Debit card. Ended up paying with an actual credit card and it worked. Think it has something to do with monetary conversion (In my case US to Euro). I see what you all are saying about the multi-touch, and that makes sense. I really only have my phone to go on and I know there is a nasty flaw in it. I am just so used to dealing with the issues because the Motorola Droid 2/2 Global/X all suffer from the horrible issue where the touchscreen hardware interface has the bug. I question how Motorola could release so many devices where the tracking ability degrades the longer you press on the screen, its very frustrating. Like if I run the multitouch app and hold my fingers like I am playing a game after a while (little over a minute) of use the touch circles just start swapping and stuff. Hopefully my explanation at least explains to people using a Moto Droid series phone why they may have issues. In any event at least on the Droid 2 the touchscreen controls work much better for me than any other emulator or on screen controls. Keep up the great work. I can initate downloading from PC-market. Downloading icon pops up on my Smart phone but after ~2sec just disappears. BTW Thanks for fast reply, and sorry for my English. I don't mean to hurt your language. I just clicked on "refund" in market, and it's done. Does it mean I don't have enough money on account? I bought app few days ago. The emulator does not work anymore on my Nexus S since the last update. Each game I try force closes. Last edited by Nemark on Sat Feb 19, 2011 6:12 pm, edited 1 time in total.